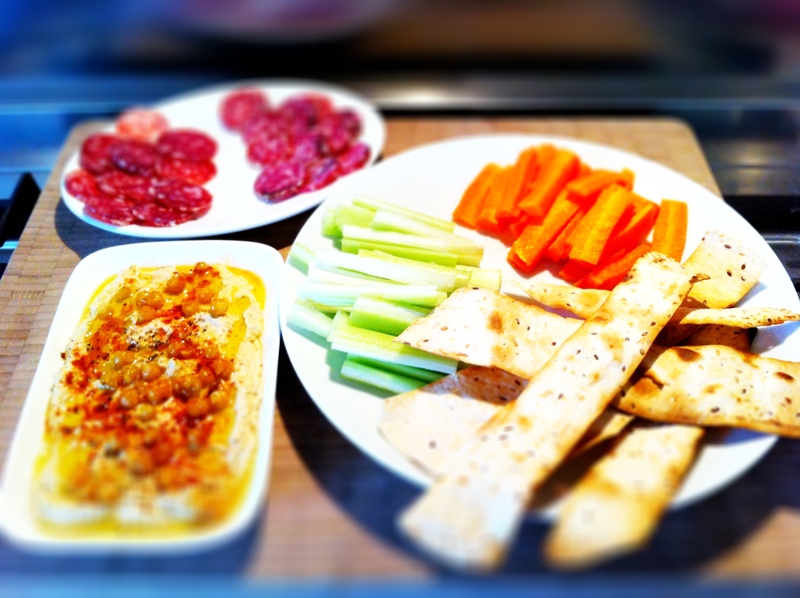 Perfect TV or party snack food. I’ve had a can of chickpeas sitting in my cupboard for almost a year – that’s how long it’s been since I’ve wanted to try making my own hummus. Sooooo many people have said that hummus is easy to make but when you work a busy nine to five, it’s not always ‘so easy’ to want to get your food processor set up, measure out all of the ingredients and then deal with the washing up when you know any supermarket or corner shop will have tubs that you can buy. I’ve also always known that home-made hummus must taste so much better, I’ve read enough blogs and recipes that say so, but I finally put it to the test myself last weekend. I’ve based my recipe on a very, very simple one I found on the BBC website, and what I’ve discovered I like most about making my own hummus is the fact that there’s so much leeway to tinker with the taste. I’ve already made two batches to test out on my friends. I love eating hummus with fresh carrots and celery sticks but my favourite is to eat it with some toasted wraps. 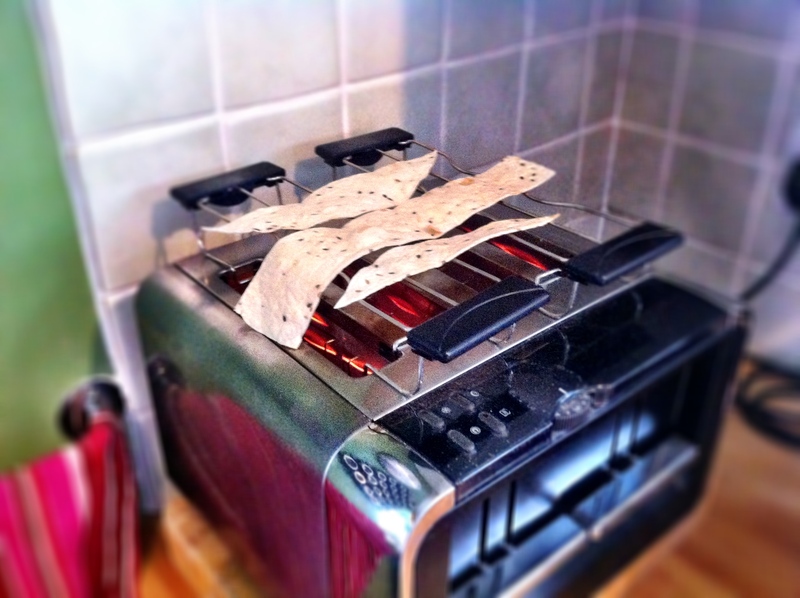 I often find pita bread far too doughy or thick for my liking, and I love the seeded wraps I can get so what I do is cut my wraps into strips and simply toast them to make them crispy and crunchy. It works a treat and people are always surprised by firstly how they look, and secondly how tasty they are. The strips are the perfect receptacle for scooping the hummus off the plate and into my mouth! Most people won't realise these are simply toasted wraps. My favourite are these seeded wraps. A healthier way of snacking. 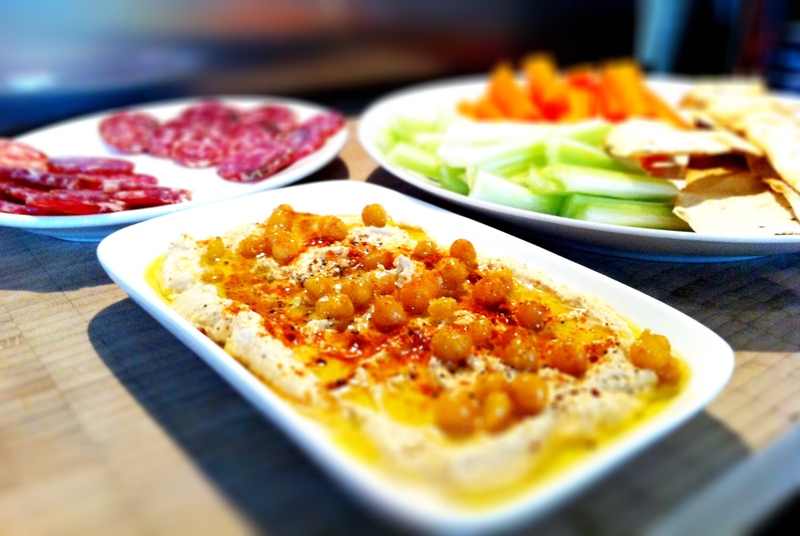 Home-made hummus made easy! In a good processor, put your chickpeas, tahini, lemon juice, paprika, water, hot paprika, cumin and a good pinch of salt and blitz for a couple of minutes until smooth. Taste and season with more salt, lemon juice and pepper as required. In a small saucepan, heat your olive oil and then gently fry your remaining chickpeas with a good pinch of salt. Ladle your blended hummus on to a plate, top it with your fried chickpeas and pour all of the olive oil over the hummus as well. Finish with a squeeze of lemon juice and a sprinkle of sweet smoked paprika and black pepper. Your toasted wraps look beautiful — what a good idea. It’s hard for me to get excited about pita unless it is warm right out of the oven. I’m very surprised you’ve never made hummus – you should do it more often, it’s SO much better than the shop one. Nice one, Noodle! I agree it’s so much better (and cheaper) to make your own! Yum! This looks beautiful and easy and delicious. Thanks for this recipe idea. 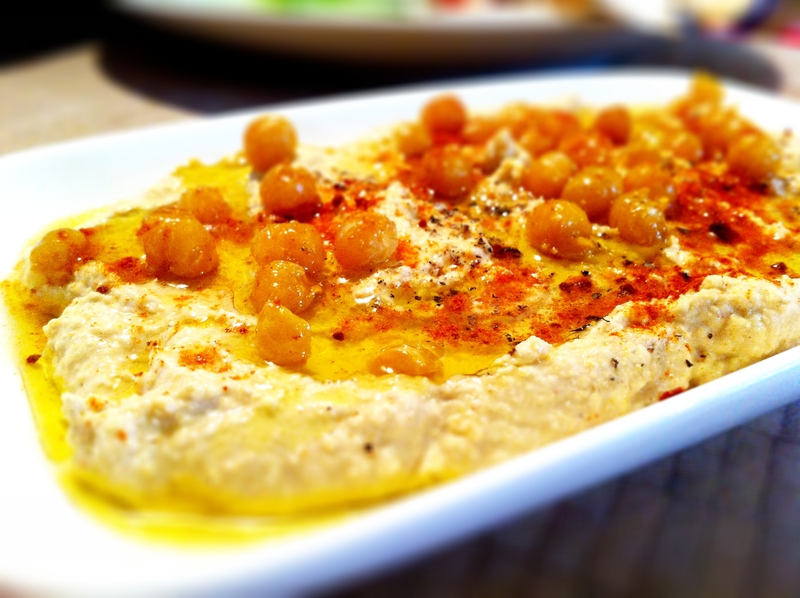 I love the idea of frying some of the chick peas and using that to top your homemade hummus – yum! Absolutely agree. 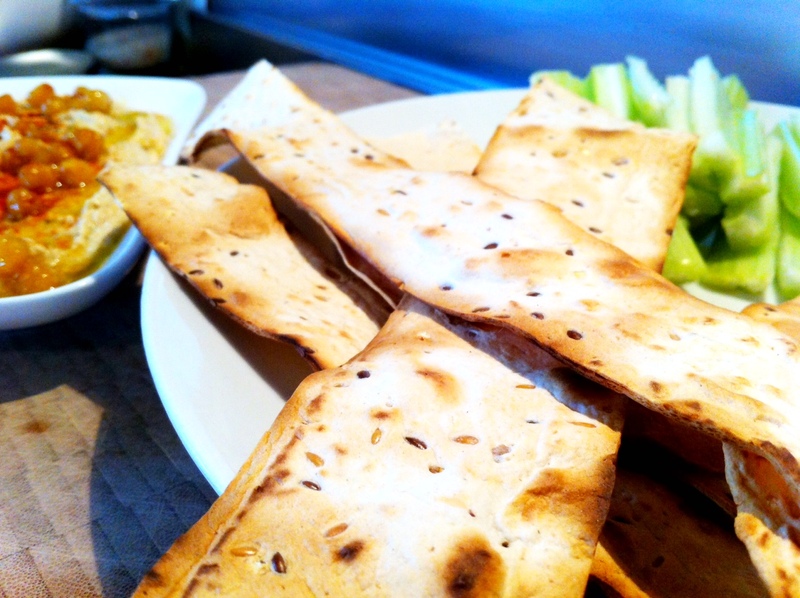 Your hummus looks amazingly delicious. I need to embrace my Vita Mix and make some hummus:) Thanks for sharing & Have a Great Weekend! I’ve never made it myself either – must try it! I like how you added the drizzle of oil and garbanzo beans on top for garnish. Nice touch. You’ve just given me tonight’s appetizer. You are right about homemade being the best hummus. I’m guessing that the whole toasted cumin would be better too!